So… just when I thought I had finalised the boundaries of Engadinesia, I had a thought… what about adding in the areas that speak Ladin, in the Dolomites? This is essentially the four valleys around Piz Boè (clockwise from the north: Gadertal/Val Badia, Buchenstein/Fodom, Fassatal/Fascia, and Gröden/Gherdëina) as well as the valley around Cortina d’Ampezzo/Anpëz a bit further east. 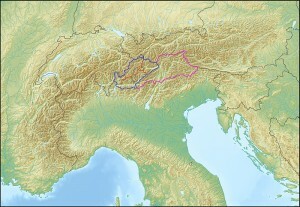 Some say that the language of Nonstal/Val di Non is also Ladin rather than a dialect of Italian. So I had a look at the boundaries that would result from that. 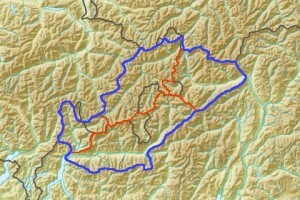 The five main valleys where Ladin is spoken are divided up between three Italian provinces *here* (Trentino, Südtirol/Alto Adige, and Belluno); some say that this was done deliberately, to splinter the Ladin-speaking community. Be that as it may, I let myself be inspired by the province boundaries of Südtirol and the language boundaries of the Ladin-speaking areas as marked on this map; you can see the result on the map above. That would also have the advantage that Engadinesia would not be so teeny-tiny any more. But it wasn’t completely satisfactory, for some reason. Partly, I suppose, because I had already done so much work on the boundaries, and partly because that region was not traditionally associated with Switzerland, Graubünden, or its predecessor leagues. So I decided I might leave it a bit more similar to *here*. After all, whether or not the various Ladin languages/dialects are related to the Romansh ones isn’t clear (that’s essentially the Questione Ladina). So I think I would posit some Ladin-ish Graeclangs in the Dolomites in the east, surrounded by a German-speaking area (whether that would belong to a Germany-ish, Austria-ish, Italy-ish, Switzerland-ish, or other-ish country is open), and some Romansh-ish Graeclangs (of which the standard is Engadinese) in the west. I also decided I would probably not make Engadinesia into a country, since it would be pretty small one. Instead, I would probably make both Engadinesia and Rhaetia be provinces of a bigger country, possibly a Switzerland-ish one. I might have to update the nomenclature of my subdivisions (provinces and districts might become districts and circles or something, if Engadinesia itself is a province), or I might call Engadinesia a canton or something and leave its provinces. On the other hand, “province” might not be quite the word for so small an area. Anyway. I thought the “provinces” (as I’ll call them for now) would follow the natural river valleys, so I’d have, clockwise from the northwest: Inn, Adige, Adda, and Mera (these are the English names). The provinces would be named after the main river. I also decided to split up the provinces into districts, and have a semi-final hand-drawn map of those, but haven’t digitised those borders yet. The districts I’m planning to call by the name of the main town in them, in most cases. So, now that that’s more or less settled, I just have to see about settling on the actual names in Engadinese — and figure out a better name for the language and the country than Engadinese/Engadinesian!